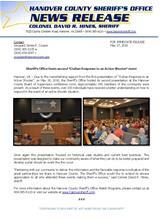 Hanover, VA – Due to the overwhelming support from the first presentation of “Civilian Response to an Active Shooter”, on May 26, 2016, the Sheriff’s Office hosted its second presentation at the Hanover County Board of Supervisors conference room. Approximately 140 members of the community were present. As a result of these events, over 330 individuals have received a better understanding on how to respond in the event of an active shooter situation. Once again this presentation focused on historical case studies and current best practices. This presentation was designed to make our community aware of what they can do to be better prepared and develop a plan should an event like this occur. “Partnering with our community to deliver this information and the favorable response is indicative of the great partnerships we share in Hanover County. The Sheriff’s Office would like to extend its sincere appreciation to all who attended these events making them a success,” said Colonel David R. Hines, sheriff.